This luxury two bedroom villa with jacuzzi is equipped with a kitchen (ceramic hob. oven. fridge. microwave. cutlery. kitchen utensils. crockery and glasses) and living room. television and a selection of satellite channels. air-conditioning. the two bedrooms have en-suite bathroom. one with bath and all of them with hydro-massage shower terrace furniture. The complex has two swimming pools on different levels (one heated). they are located in the central part of the complex. There is also a children s pool. the extensive sunbathing terraces and Pool Bar make up the whole bathing area. 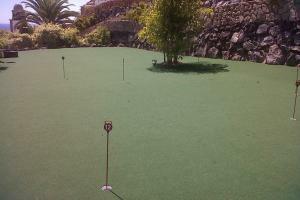 The Villa is located withing the grounds of Costa Adeje Golf course. Within a 10 minute drive you can reach another 3. From La Caleta you can walk to a natural beach which is only 5 minutes away. The Bahia Del Duque is a very popular white sandy beach and is approx a 15 minute walk along the coastline.